The beautiful crema marfil floor in a Nashville residence had lost its luster due to years of traffic and use and no professional maintenance. You can see for yourself in the BEFORE image the poor condition of the floor. We used masking tape and sheets of plastic to protect the baseboards, floor to ceiling windows, and surrounding areas. Our technicians are always mindful of our customer’s property and are in the habit of masking and protecting in every job we do. 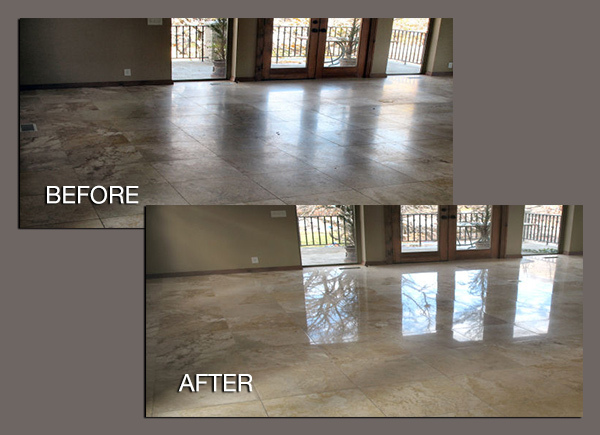 We honed the stone using diamond abrasive pads and a floor machine to remove the damage on the stone’s surface, and then we polished the floor to the beautiful shine you see in the AFTER image. What a difference! For more information about our marble polishing and restoration services, visit our Marble Services page. For a free estimate on marble or other natural stone polishing, repair, or other services throughout Tennessee, including Nashville, Memphis, Knoxville, Murfreesboro, Clarksville, and Chattanooga and surrounding areas, contact us online or call (615) 351-4676 today.